If you typically purchase the Sunday newspaper for the coupons inserts, there will be 3 inserts in this Sunday’s paper – 1 P&G, 1 Red Plum (RP) and 1 Smart Source (SS) insert. 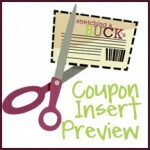 View a list of possible coupons in the 10/14/12 inserts in My Coupon Database. It seems that here in Pittsburgh, PA they never stick to the delivery schedule for what’s included each week. I just got my newspaper delivered today and there was a Smart Source and a P&G in it for 10-14-2012 If ever there is something missing from our copies its Red Plum. I don’t know if Red Plum just doesn’t included them in my area or what? We used to get a weekly Penny Saver mailed to us which included the RedPlum coupons, but no longer is that the case since we moved to the other side of the city and in a new zipcode. Very odd. Many markets have gone to mailing the Red Plum inserts instead of having them in the Sunday paper. I believe you can find a contact # for Valassis/Red Plum on their website if you want to ask about your local area.